Fiction – paperback; Vintage; 208 pages; 2009. It’s been 10 years since Murray Bail’s last novel, the oh-so wonderful Eucalyptus, which is one of my all-time favourite books. I was anxiously awaiting this new one and had it on pre-order from Amazon for what seemed like forever. When it thudded through the mail box late last week, I devoured it hungrily. Unfortunately, I was slightly disappointed by it. I’m not sure why. The writing is exquisite, with touches of modernism (Patrick White came to mind on more than one occasion), and the characters are wonderful: well drawn, believable and quirky. The narrative, however, is vague, and there were times when I wondered, where is Bail going with this? The story is told from two intertwining perspectives. The first is largely from the point of view of Erica, a 45-year-old unmarried philosopher from Sydney, who is sent to a sheep station in the NSW outback to appraise the work of another philosopher, Wesley Anthill, who has died and left all his papers in his writing shed. The second is told from Wesley’s point of view, first as a young man, who leaves the farm and moves to Sydney in search of “experience”, before wandering through the UK and Europe, and then returning home to toil away on his life’s work. It’s made clear from the start that Erica is a fish out of water. She’s city born and bred, and the prospect of going over the Blue Mountains into the outback fills her with dread. To alleviate the boredom, she takes along her good friend, Sophie, a psychoanalyst. The dynamic, and the unspoken tension, between this pair certainly enlivens the narrative, particularly when they arrive at the sheep station and find their hosts, Wesley’s siblings, Roger and Lindsey, are reclusive country bumpkins not used to talking, much less entertaining two “sophisticated” guests. Also on the table was a bottle of tomato sauce, almost finished, the leftovers clinging to the insides, like the remnants of the British Empire. Men in the square were happily playing boule in the face of their fast-approaching deaths. Much of the book is a kind of treatise to philosophy — and posits that the Australian climate and landscape do not generate the kinds of conditions necessary to develop philosophical thought. Hot barren countries — alive with natural hazards — discourage the formation of long sentences, and encourage instead the laconic manner. The heat and the distances between objects seems to drain the will to add words to what is already there. What exactly can be added? ‘Seeds falling on barren ground’ — where do you think that well-polished saying came from? And he juxtaposes this with the idea that Sydney may not be a philosopher’s city but it is “the most psychological city in the world” where people go into therapy to talk about themselves. What is going on here? The skies are blue, forever cloudless — is that it? A great emptiness sending people back to themselves. Now that the city is up and running, no longer a country town, there’s been a transference from the landscape and its old hardships to the self? There are some big ideas here, and I suspect anyone who’s studied philosophy (I haven’t) will love it. But I was left wondering whether I had missed anything. Was Wesley’s philosophy anything more than the average Australian youngster who backpacks through Europe and returns home feeling as if they’ve discovered themselves and the world? 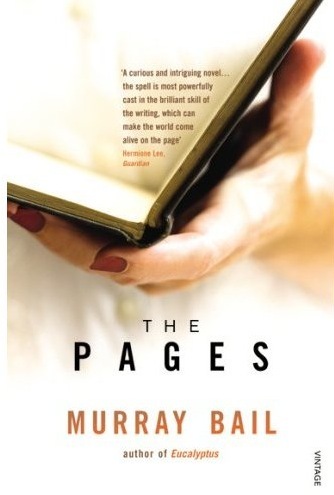 The Pages was shortlisted for this year’s Miles Franklin Award but lost out to Tim Winton’s Breath. I read the hardcover version of this late last year and had a very similar response to yours. Ball opens up a lot of potentially interesting stories (the relationship between the two women, the whole philosophy angle, the relationship between the brother and sister at the sheep station) and then fails to develop any of them. Perhaps he deliberately meant that the reader should flesh out those stories and fill in the gaps — I got the feeling as the book went on that I was working harder at it than the author did. Having said that, for someone who has never been to that part of the world, the strongest part of the book was the depiction of the “climate” around the sheep station and the occasional contrasts with Sydney and even Europe — I could have done with a lot more of that too. Agree. Not much seems to develop: there’s too much divergent stuff going on, perhaps he didn’t know which strand to concentrate on most? He could have taken it in so many directions, couldn’t he? I doubt he could have developed them all but concentrating on one or two would have helped. A reflection of this problem, I think, is illustrated by the contrast between the hardback and trade covers — both are accurate, but it is hard to believe they are the same book. Oh, I am not going to read this now … as I will be reading the book in the next couple of months. I’ll save it until then. I loved his Eucalyptus – one of my favourites of all time – but sense that I need to approach this with a new mind. Cheers. Your review is wonderful, Lisa. I do think this is an amazingly clever book that needs to be read carefully – there’s definitely a lot going on. And I like your idea that each character needs to be taken out of their comfort zone to learn something important about themselves. I think Bail has an interesting take on how the landscape affects our personalities. The first four years I lived in London I used to get this “thing” where I had to see the horizon or I’d go mad. Used to hit me every few months. It no longer became a problem when I worked in an office tower with 360-degree views across London. Wonderful review. I read Eucalyptus years ago and loved it, but at the same time I remember feeling the same “vagueness” in the narrative that you describe in The Pages. What can I say but that I wholeheartedly agree with your review and other commentors here. There was some beautifully written pieces in this novel but it ultimately left me cold. I ended up thinking it is one of those “worthy but not ompletely engaging” type novels. I know what you mean about lack of dialogue making the plot ‘fuzzy’ but that wasn’t the case here. There was quite a lot of dialogue – and much of it humourous. The problem here was too many divergent strands and lack of development of any particular thread. See Kevin’s comment above for a better explaination. Parts of it are like poetry and there’s plenty of big ideas being explored and I loved most of the characters. It just lacked a proper narrative, in my humble opinion, so I always felt one removed from the story.